02/20 Performance and Lecture: Jazz in the Gallery @ MoAD (Museum of African Diaspora) with Drummer Jaz Sawyer and his group, 3RIO – Join Jaz Sawyer in tracing the musical influence of the international port of New Orleans, the melting pot for creative music innovation and cultural exchange that is the wellspring of the American art form, jazz. Explore the African American experience of cultural resilience through dance, singing and drumming traditions that fused elements from various cultures with gospel, blues and the Latin tinge. 02/23 Vocalist Paula West @ The Rrazz Room in the Hotel Nikko San Francisco – The last few weeks of her phenomenal 8 week engagement at The Rrazz Room. This will be my second time seeing her during this engagement. If you have not seen her yet, what are you waiting for? 02/23 Joe Warner Trio @ Kaleidoscope SF – From Joe: “I lead the session at Kaleidoscope every 2nd and 4th Wednesdays. I have a great group put together for this Wednesday featuring Lorca Hart on drums and Zach Ostroff on bass. Kaleidoscope is a cool arts venue in the Mission District and needs your support to stay alive. Come buy a couple drinks, listen to the music, and sit in on the second set. No cover!” Check them out!!! 02/24 Vocalist Rhonda Benin @ Freight and Salvage in Berkeley – In celebration of Black History Month (and her own birthday!) 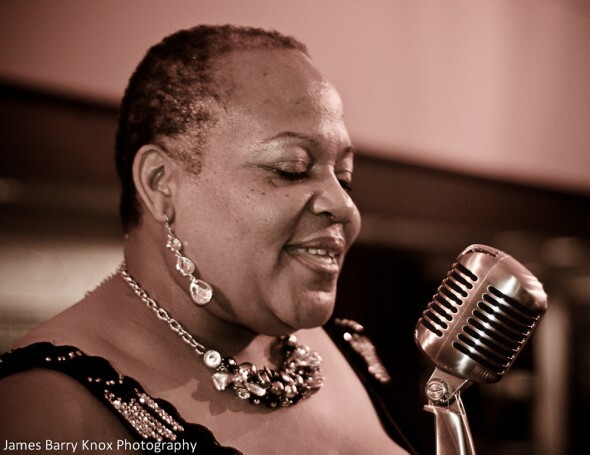 song stylist Rhonda Benin presents “Love Letters Make Me Misty Blue,” bringing to our stage music of the great unsung soul divas of the 1960s, like Martha Reeves, Ketty Lester, Gladys Knight, and Betty Everett. 02/25 Violinist Regina Carter with Oakland East Bay Symphony – Internationally renowned jazz violinist Regina Carter is soloist for a new violin concerto written for her by composer and jazz pianist Billy Childs. Carter, known for her passionate playing, brings audiences to their feet, whether on tour in Europe or in her hometown of Detroit, where this work received its world premiere in January. San Francisco Performances is proud to be a co-commissioner and to partner with the Oakland East Bay Symphony to bring this Concerto to our audiences. 02/26 Junius Courtney Big Band with Denise Perrier@ Freight and Salvage in Berkeley – With a brand new CD to release—Us—and a big dance floor to fill, there’s plenty to celebrate, and the Junius Courtney Big Band wants you in the house for a Saturday night party! 02/26 Terrence Brewer Trio @ 57th Street Art Gallery in Oakland – Terrence Brewer Trio concert celebrating Black History month with a concert at one of Oakland’s most amazing fine art/music galleries! This entry was posted on Saturday, February 19th, 2011 at 1:09 pm. It is filed under Freight and Salvage, Music News/Info, The Rrazz Room, Yoshi's and tagged with 57th Street Art Gallery, Denise Perrier, Freight and Salvage, Greogry Porter, Jaz Sawyer, Junius Courtney Big Band, MoAD, Oakland, Oakland East Bay Symphony, Paula West, Regina Carter, Rhonda Benin, Ronnie Laws Quartet, San Francsico, Terrence Brewer, The Rrazz Room, Wayne Wallace Latin Jazz Quintet, Yoshi's. You can follow any responses to this entry through the RSS 2.0 feed.